What’s fast and easy to grow, crisp and tasty and goes from seed to the table in 30 days or less. You guessed it, radishes. There are 2 main types of radishes grown by home vegetable gardeners, annual radishes and winter or storage radishes. There is a third type, although not common in the home garden, is the varieties that are grown specifically for their seeds or seed pods, rather than their roots. This great addition to the vegetable garden has a taste that varies with variety going from mild to sizzling hot comes in a wide variety of sizes, shapes and skin colors. The size of different varieties ranges from those no bigger than a quarter to the giants weighing in at 50 lb's (22.68 kg) or more. They can be round or elongated with colors including red, pink, purple, black, white and yellow. Most common varieties are Cool season vegetable however some varieties grow well in summer. Radishes like a sunny position in the garden but will do alright in partial shade. They require a minimum of 4-6 hours of direct sunlight daily. Soil needs to be well drained, if aged cow or horse manure is available this will make a perfect seed bed. Sow seed in the spring and again in mid-summer for fall-winter harvest. Sow 1/2 inch (12 mm) deep. 1-2 inches (25-50 mm) apart in rows 12-18 inches (30-45 cm) apart. Or alternatively seeds can be broadcast over an area and cover with 1/2 inch (12 mm) of soil. 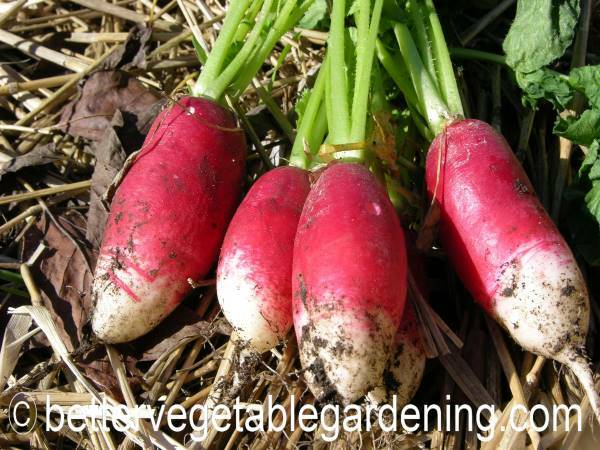 Quick growing radish seeds are often sown with slower germinating vegetables like carrots or parsnips to mark the rows. Even though radishes are quick to grow weeds can still be a problem if the bed is not well cultivated before sowing. Keep soil moist especially as the season progresses into summer, mulch mulch mulch. Radishes are not heavy feeders however fast growing vegetable need a reasonable good soil to produce. Typical practice is to apply 2-3 quarts per 100 sq feet (2.2-3.3 liters per 9.3 square meters) of All-Purpose 5-5-5 Organic Fertilizer 2 weeks before sowing. Depending on soil fertility side dress as required. Follow root crops like radishes, carrots, parsnips and beets with leaf vegetables. Most of the cabbage family and lettuce are fine for this. Spring radishes can be harvested in approximately 25 to 35 days. Winter radishes vary a lot more depending on variety from between 45 to 70 days. Short term; refrigerating, remove tops, package radishes in a perforated plastic bag in the crisper section of your refrigerator. They will hold about 2 weeks. Radish Long Term Storage; Winter radishes only, summer radishes will not store very well long term. Pack radishes in a container of damp sand or saw dust and place in a cool, dry location; they will last for months.